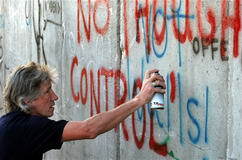 I was deeply disappointed to learn that you have decided to build a wall between yourself and your Israeli fans. We love you here in Israel. Surely, you must know that from the warm reception you received when you performed here five years ago at the Jewish-Arab village of Neve Shalom. I’m surprised that you would choose to side with the extremists who don’t believe in dialogue. I come from a small town in Israel called Sderot. My hometown is frequently bombarded with missiles from Gaza — eight years of children living in fear, eight years of running to bomb shelters. Yet I meet and play music with my Palestinian colleagues. When there is bad news, we do not boycott each other; we argue. Even when it’s hard, we try to keep in touch, because we know that peace starts with musicians playing together, with the two peoples getting to know each other. Unfortunately, the Middle East isn’t the most stable place, so Israelis know we have to be very careful as we pursue peace. We could sign an agreement with a moderate regime and suddenly find ourselves confronted with a fundamentalist enemy. We withdrew from Gaza and got Hamas. We pulled out of southern Lebanon, and now Hezbollah dominates the Lebanese government. We gave back the Sinai, and now Egypt is a great unknown. Still, we yearn for peace. We try to talk with our neighbors in the Palestinian Authority, where life is getting better for ordinary Palestinians. If Hamas’s leaders would stop the bombardment of Israeli civilians and stop calling for our destruction and start having a normal relationship with their brothers in Ramallah, I’m sure that most Israelis would want to talk to them, too. And our wall, which you want to see dismantled, will fall when we have lasting quiet. Insha’Allah. But in the meantime there are events like the murders in Itamar. Terrorists sneaked into a family’s home while they were sleeping and cut their throats. That settlement was outside of our security fence — they did not have this “appalling edifice,” as you called it, to protect them. A father, a mother and three kids — one a 4-month-old infant — paid the price. Should we give up the fence that has made the last few years mostly free of suicide bombers? If we did, would you stand by our soldiers when they go out to intercept terrorists, or would you continue tying our hands while we fight to protect our citizens’ lives? I didn’t hear your voice, or the voices of your friends in the BDS movement, when thousands of Qassam rockets were being launched at my hometown and neighboring communities after we got out of Gaza. We only heard the world’s voice when we fought back. Jews have come home to Israel after centuries of living under Christian and Muslim “hospitality.” My own parents immigrated to Israel from Tunisia; they had to give up all their property and start their lives over. Jews from around the world came to Israel to fulfill our ancient dream of returning to our homeland, and to bring an end to our long nightmare of having no country to call our own. Now you, in effect, are demanding that we forget all our dreams and become a minority in our own homeland. Are you serious? Have you not seen how the Coptic minority is treated in Egypt? Have you not seen how the Kurds have suffered in Turkey and Iraq? We won’t share their fate — we have had enough of that already. At your age you ought to be suspicious of open-and-shut narratives of the sort embraced by the BDS movement, and be willing to look more deeply at the other side. Of course, we Israelis have plenty of room for improvement and could do more to pursue peace. But you should understand that if we are cautious, it is because our very survival is at stake. If you truly want to be helpful in bringing about peace, embrace the power of dialogue, not boycotts. Music is for breaking down walls, not for building new ones.